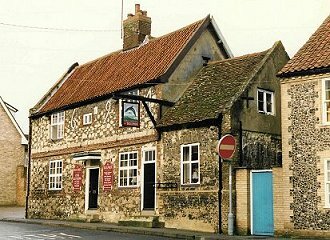 FREEHOUSE Renovated by Clive & Sam Vooght and Karen Smith and Sean Licence to reopen March 2013 as a ` Specialist Steak House'. Said to have been rebuilt 1694 and reputed to have existed several hundred years before that. To Let with entry on 11th October 1837. With extensive Stabling, Barn, Piggeries, Granary, Yards and Garden. Long frequented by Drovers to and from Norwich and Dereham Markets. It was reported that Thursday 24th September 1953 was the first time in 23 years that 69 year old Albert Cannell had not served beer at the house. Earlier, the licence had been temporarily transferred to Mr. D. Carnelley, the Thetford footballer. When Mr. Cannell first arrived at the house, beer was 4d a pint, which was considered expensive since it had been 2d a pint in pre-1914 days. By 1953 it was 1s 1d a pint. During the 1914-18 war he had trained with the South Suffolk Regiment, but in France he was transferred to the 9th Battalion Essex Regiment.